Whilst I was away, Newham council responded to the Freedom of Information request I submitted on 20 February, which asked for "a detailed breakdown of the council's 'Preventing Violent Extremism' (PVE) spending in 2010-2011, including expenditure on PVE supported projects, information on salary costs, project expenditure, publicity or other budgeted items". Once again, this tells us very little. There is no detail on how the PVE-supported projects totalling just over £100,000 are broken down, although this represents (after staffing costs) the lion's share of the expenditure. It will also be necessary to submit a further FoI request to find out how many times the council's graffiti control officers responded to extremist vandalism and for what purpose - I know only of the incident in Plaistow where a Jewish resident 's home was daubed with swastikas and racist abuse and this was outside of the period covered by the PVE spending above. 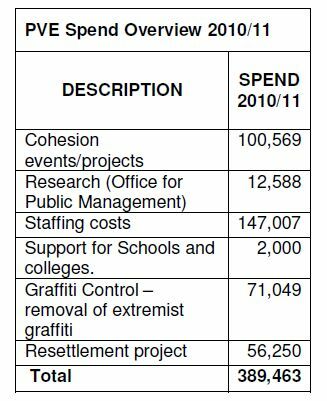 It would be helpful to know if the money was simply used instead to subsidise the council's overall response to graffiti and vandalism and if not, whether specific incidents of extremist graffiti indicate a more significant threat from the far-right than from Islamic fundamentalism. If this is the case, is this also reflected in other areas of PVE expenditure? Getting information out of Newham council on PVE is still like trying to get blood out of a stone. The Freedom of Information Act makes clear that people requesting information have a right to all the relevant recorded information a public body holds and yet again, Newham has failed to provide it. A request for an internal review has now been submitted. Why is this important? Because close to £400,000 of public money was spent on tackling local radicalisation, an issue that no participant in the research by the Office for Public Management mentioned in the spending overview (a report published in September 2010) said was "a particularly significant issue in Newham, especially when compared to wider issues of socio-economic deprivation in the borough". As the Office for Public Management also reported, "mistrust of the agenda is also a function of people feeling that there has been a significant lack of information and communication about Prevent funding and delivery at the local level". As far as I can see, that significant lack of information and communication is still an ongoing issue. 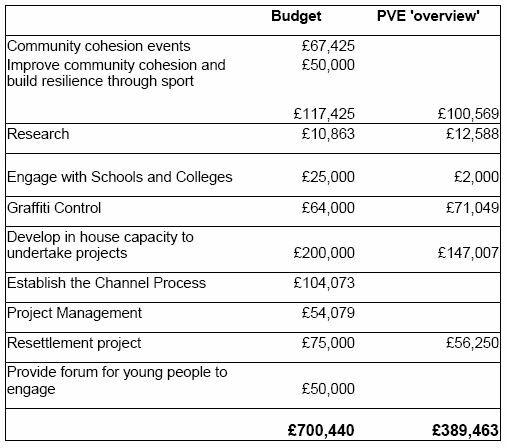 I have tried to see whether the PVE 'overview' makes any more sense by comparing it to the budget that I eventually managed to drag out of Newham council last year. These are the results, based on guesses on what the different areas of expenditure actually relate to ( for example, I've assumed that the 'resettlement project' relates to work with prisoners, which was tendered to St Mungo's Trust). Either the information provided is incomplete to a staggering degree, or the council had a major underspend in 2010-11. My view is that it simply misleading -yet again. Community members will be developed as community activists, bringing together people across their locality who have felt left down or excluded by politics to ensure that they too have a voice at a time of economic turmoil and social change for the nation. The idea not only reaching out to a new constituency but specifically training new members as campaigning community organisers is an exciting development, one that I really want to succeed. I was delighted to receive an invitation to take part in Unite’s first Community Members training course last week. 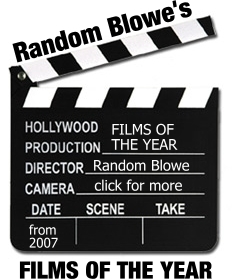 Unfortunately, it wasn’t quite what I expected. The first problem was that Unite forgot, in their enthusiasm for what is undoubtedly a ground-breaking approach for British trade unionism, that there are very few genuinely new ideas – and community organising certainly isn’t one of them. There is a wealth of experience out there already about building permanent community-level campaigning networks. Saul Alinksy’s book ‘Rules for Radicals’, has been in print since 1971 and there are organising models from grassroots activist groups in the US like the Association of Community Organizations for Reform Now (ACORN) and MoveOn to faith-based organizations like Citizens UK to learn from. There are some very useful resources online, including this from Education Action. Even the government is funding a Community Organisers programme as a pillar of its ‘Big Society’ nonsense, although inevitably this version avoids any critical perspective on economic inequality and seems more concerned with self-help and reducing ‘dependence’ on the state. Whether people agree or disagree with Alinksy’s insistence on working inside the system, are troubled by the evangelism of Citizens UK and its rather dismissive attitude towards mobilising individuals rather than institutions, or even endorse the concept of full or part time "Community Leaders" (I don't, as it happens), the point is that there is no need for Unite to start from scratch. At the very least, it would have been sensible to consult first with the union’s own voluntary and community sector branches and then talk to local and national organisations (the National Coalition for Independent Action, for instance), to draw up materials tailored to the specific needs of training community-based campaigners. For that’s the second problem to overcome: organising in the workplace is very different from community campaigning. People are usually in daily contact with their work colleagues, union meetings are usually held in the workplace and the solidarity of trade unionism is built predominantly around employment issues. Staying in touch with a community network of members, particularly those who are stuck at home, who are busy searching for work or who have childcare responsibilities, throws up completely different challenges. How do they stay in touch and where do they meet? There is the question too of what interests and issues are likely to motivate people to become community organisers - and if we want durable community branches, how do we ensure members remain motivated? The argument has to be more than ‘the cuts are bad’, which may be a reason why people might support a local anti-cuts coalition, but how is union-affiliated community membership different? And who are Unite hoping will become the coordinators of local community branches – presumably not overstretched workplace organisers? So who? I attended the Unite course hoping to find some answers to these questions, but instead sat through a rehashed version of its workplace activist training and was expected to flag up the many problems with it. This was incredibly frustrating, especially as I had taken annual leave to attend (those of us who aren’t already shop stewards don’t get time off for union work and as I’ve said, busy workplace organisers are the last people who should be at a course for a completely new way of campaigning). It struck me that in its haste to roll out its new level of membership, Unite had carried out too little preparation and had simply taken too many short cuts. I was almost relieved that unexpected events at work meant I couldn’t attend the second day. Activists feel very good about how they are "fighting the power." But in the absence of a coherent strategy, a coherent target, a process for maintaining a fight over an extended period of time, and an institutional structure for holding people together and mobilizing large numbers, they usually don't accomplish much. I largely agree - this could almost be a fifty word explanation of the general failure of the left to build sustainable institutions and movements. In the context of Unite’s community membership, it’s not enough to just announce a new way forward with little understanding of how to get there. I still really want this initiative to succeed, but based on experience so far, there is still an awful lot more thinking and planning to undertake if this is even a possibility.